Latin America has been one of the critical areas in the study of comparative politics. The region’s experiments with installing and deepening democracy and promoting alternative modes of economic development have generated intriguing and enduring empirical puzzles. In turn, Latin America’s challenges continue to spawn original and vital work on central questions in comparative politics: about the origins of democracy; about the relationship between state and society; about the nature of citizenship; about the balance between state and market. The richness and diversity of the study of Latin American politics makes it hard to stay abreast of the developments in the many sub-literatures of the field. 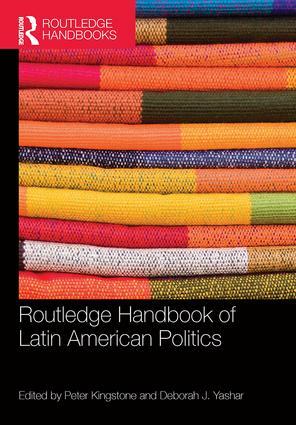 The Routledge Handbook of Latin American Politics offers an intellectually rigorous overview of the state of the field and a thoughtful guide to the direction of future scholarship. Kingstone and Yashar bring together the leading figures in the study of Latin America to present extensive empirical coverage, new original research, and a cutting-edge examination of the central areas of inquiry in the region.